This crossroads town has a community center, some ag-industry buildings, and a Methodist church. The historical marker on the church says it was founded in 1915 by the Rev. T. C. Willet, who rode his bicycle from Tahoka to preach here. (That’s about a 40 mile round trip on the current roads.) That was my second favorite thing about the church. My favorite thing was this picnic shelter next to it, with that tiny square of shade to protect the picnicking parishioners. 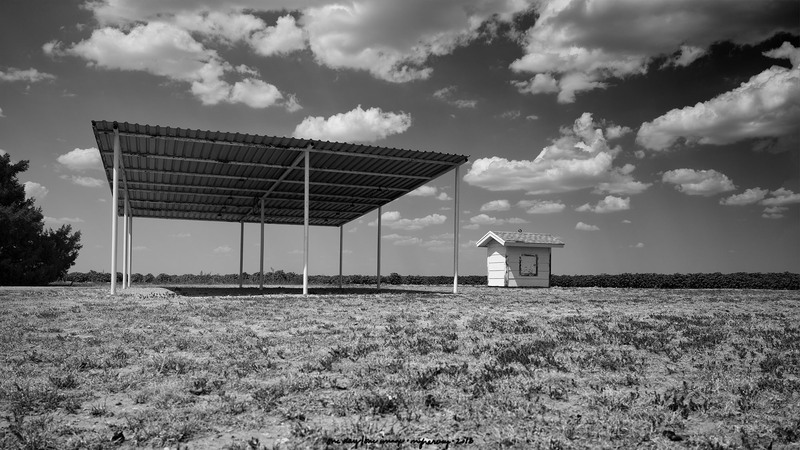 Posted on August 6, 2018, in Photography and tagged 365 photo project, black and white photography, church yard, garza county, learning to see, Leica, melinda green harvey, monochrome, one day one image, photo a day, photography, picnic shelter, postaday, road trip, rural texas, texas, thoughtful seeing, travel photography. Bookmark the permalink. Leave a comment.